Scott Sanders, a.k.a. “The Hamburger Man,” is the newest World Series of Poker Circuit Main Event Champion. 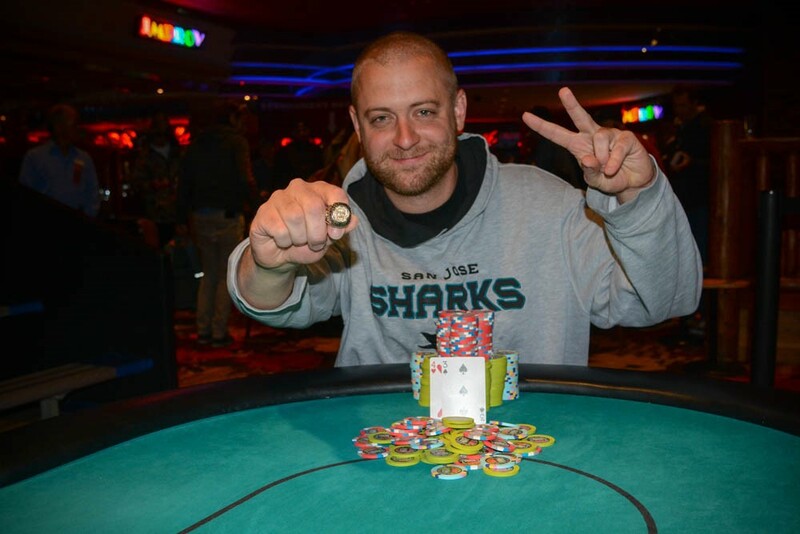 The 30-year-old from San Jose, California navigated through three days of tournament poker at Harveys Lake Tahoe, conquering a field of 442 entrants in Event #10: $1,700 No-Limit Hold’em Main Event. The crowning achievement was actually Sanders’ second of the series. Before becoming Main Event Champion, Sanders first captured the title of Monster Stack Champion by defeating 332 entrants in Event #8. Between his Monster Stack payout ($25,201) and six-figure payday in the Main ($147,314), Sanders banked nearly $175,000 in WSOP earnings during the Harveys Lake Tahoe Circuit. Nick Pupillo opens to 300,000 on the button and Scott Sanders three-bets to 1,025,000. Pupillo snap-calls. The flop comes and Sanders checks. Pupillo bets 800,000 and Sanders check-raises all in. Pupillo quickly calls for 2,900,000 total. Pupillo is at risk with for a pair of nines, up against Sanders' for a straight draw. The turn is the to give Sanders his straight, but Pupillo picks up a straight draw in the process. The river is the and Sanders holds to eliminate Pupillo in 2nd place. Nick Pupillo opens to 300,000 on the button. Scott Sanders puts out a three bet. The dealer breaks it down. The bet is for 1,025,000. Pupillo calls, bringing the flop. Sanders leads with a bet of 975,000. Pupillo calls. The turn is the . Sanders jams. Pupillo has him covered by about two million. Pupillo lays it down. Nick Pupillo raises to 275,000 on the button. Scott Sanders defends his big blind with a call. The flop comes . Sanders checks. Pupillo bets 300,000. Sanders completes a check-raise to 900,000. Pupillo moves all in and Sanders calls. Sanders shows for top pair and Pupillo turns up for a flopped straight. The turn and the river bring the two more sixes, the and . Pupillo's all-in count is for 3,600,000. Sanders pays the due and the chip lead has swapped. Scott Sanders raises to 275,000 on the button and Nick Pupillo calls. The flop comes , Pupillo checks, Sanders bets 225,000 and Pupillo calls. The turn is the and both players check to the on the river. Pupillo checks, Sanders bets 350,000 and Pupillo tank-calls. Sanders tables for aces up and Pupillo mucks. 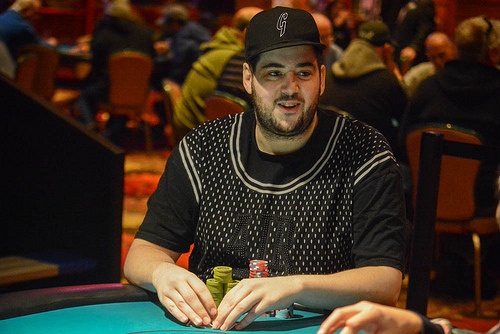 On a board reading in a limped pot, Nick Pupillo is first to act and bets 300,000. Scott Sanders calls. The river is the and Pupillo shoves all in for 1,525,000. Sanders quickly calls. Pupillo tables for two pair nines and threes which is good against Sanders' for a single pair of jacks. Heads-up play has begun with Scott Sanders sitting on 11,900,000 to Nick Pupillo's 1,600,000. 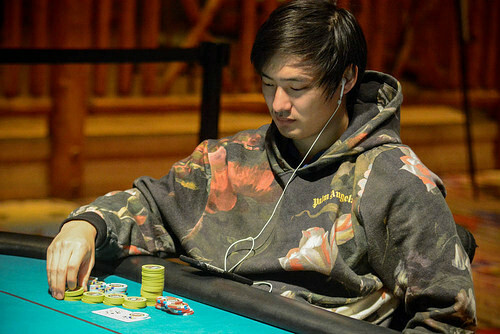 Both players are guaranteed $91,036 and are playing for $147,314, a coveted World Series of Poker Circuit ring and a seat into the 2019 Global Casino Championship. Nick Pupillo folds the button. Brett Murray moves all in from the small blind. Scott Sanders, in the big, asks how much it is. Murray counts it out for him, reaching a sum of 1,380,000. Sanders calls and the two showdown. The board completes with . Sanders improves to two pair and Murray's hopes of winning another Circuit Main Event title are squashed. Heads-up action between Sanders and Pupillo begins now. Nick Pupillo opens to 250,000 on the button and Scott Sanders defends his big blind. The flop comes , Sanders checks, Pupillo bets 275,000 and Sanders calls. The turn is the and both players check to the on the river. Sanders checks and Pupillo counts out his stack before deciding to check back. Sanders tables for a flush and Pupillo mucks. Scott Sanders raises to 225,000 on the button. Nick Pupillo calls in the small blind. Brett Murray defends his big blind. All there players move to the and all three check it down. The turn is the . Pupillo bets 300,000. Murray gets out of the way. Sanders calls, prompting the river. Pupillo checks. Sanders jams. Pupillo thinks about it for a second, then folds. Nick Pupillo shoves all in on the button for 1,080,000 and Scott Sanders calls in the big blind. Pupillo tables , up against Sanders' . "I'm using my one time right here" says Pupillo. Sure enough, the board runs out and Pupillo backs into a straight to double through. After running into Scott Sanders pocket rockets, and being left short, Nick Pupillo moves all in on the button for his last 525,000. Brett Murray folds the small blind and Sanders calls. Pupillo instantly tables , returning the favor to Sanders who has . The board runs out . Pupillo's aces hold and Sanders pays up the double. 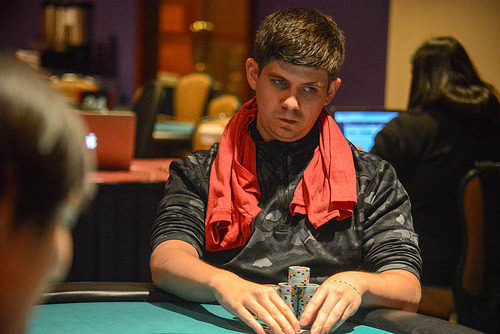 Scott Sanders raises to 250,000 from the small blind and Nick Pupillo defends his big blind. The flop comes , Sanders bets 150,000 and Pupillo calls. The turn is the and both players check to the on the river. Sanders reaches into his stack and bets 625,000. Pupillo calls. "Aces" says Sanders, tabling for two pair. Pupillo mucks. Brett Murray folds on the button. Scott Sanders shoves on Nick Pupillo. Pupillo takes a look at his cards and calls. Sanders tables and is dominated by Pupillo's . The flop comes . A ten puts Pupillo further ahead, but the board also gives Sanders an open-ended straight draw. The turn is the and the river is the . Pupillo doubles his 1,180,000 through Sanders. Nick Pupillo limps in from the small blind and Brett Murray checks his option in the big blind. The flop comes , Pupillo bets 100,000 and Murray raises to 300,000. Pupillo calls. The turn is the and Pupillo checks. Murray counts out his stack and then moves all in for 1,505,000. Pupillo asks for a count and thinks for about 30 seconds before deciding to call. Murray tables top pair, but has to fade Pupillo's flush and straight draws. The river is the and Murray holds to double through. The remaining three players are on their first break of the day. Scott Sanders holds a big lead and is pulling away, coming back to Level 30 with blinds at 50,000/100,000 with a 10,000 ante. 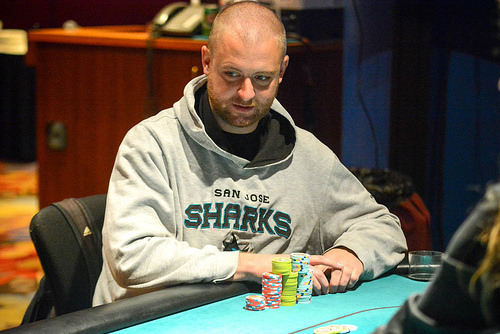 Scott Sanders limps in from the small blind and Nick Pupillo checks from the big blind. The flop comes and Sanders leads for 100,000. Pupillo calls. The turn is the , Sanders bets 280,000 this time and Pupillo calls again. The river is the and Sanders thinks for a moment before sliding forward a hefty bet of 1,200,000. Pupillo asks for a confirmation of the bet and decides to call. "I have a straight" says Sanders, tabling . Pupillo mucks and Sanders is the new chip leader. Brett Murray folds in the cutoff. Stephen Song, on the button, jams. Scott Sanders looks at his cards and moves all in for more. Nicholas Pupillo folds. A showdown commences. The board runs out . Sanders wins the flip and Song's Main Event is over. With the knockout, Sanders also eliminates Song from the race for Casino Champion. It is now between Sanders and Kevin Davis in Event #13 for the honors. If Sanders wins the Main Event the points will be mute as he will earn a bid to the 2019 Global Casino Championship that way.